Calling card of Leon McG. Wallace, presumably Leon McGregor Wallace, a New Hampshire native, who later worked as a clerk and manager at Boston, Massachusetts, and as an auditor in Vermont. The calling card was found tucked in an 1877-1891 autograph album with inscriptions mostly from people in the Brownfield, Maine, and Bridgton, Maine, area, with a few from Massachusetts and one from New York. According to marriage, death and burial records, Leon was born June 10, 1866 at Grantham, New Hampshire, the son of William W. Wallace and Diane M. (Marsh) Wallace. Leon's Massachusetts marriage record shows that he was living at Boston, Massachusetts, and working as a clerk, when he married Elizabeth Simmons Blasland of Washington, D.C., on November 29, 1895 at Boston. Elizabeth, who was born about 1870 at Washington, D.C., was the daughter of Massachusetts natives William and Ruth Blasland. Leon was living at Windsor, Vermont, when he died May 3, 1919; on his Vermont death record, his occupation was given as auditor, and he was listed as single. He's buried in the Hill Dale Cemetery at East Grantham, New Hampshire. What happened to his marriage, I don't know, but they may have been apart for some years, as the 1910 Census shows that Leon and Elizabeth were both living in Boston, but not in the same household. 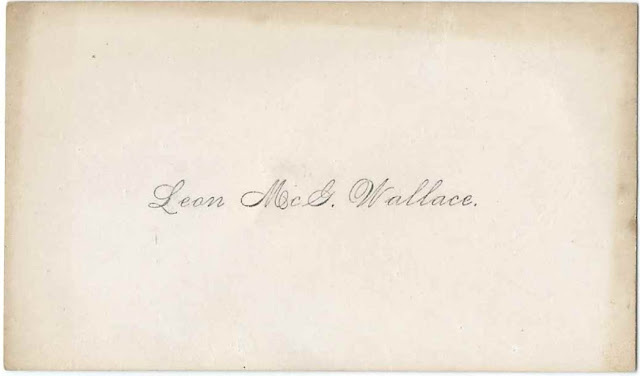 If you have information to share on Leon McGregor Wallace or if you feel that the card belonged to another Leon McG. Wallace, please leave a comment or contact me directly.